British Columbia is well known for its salmon, steelhead and sturgeon fisheries, but they can be a tough challenge for people who have never fished before. To accommodate new anglers, the Freshwater Fisheries Society of BC stocks urban lakes with rainbow trout at catchable size. These rainbow trout, more commonly known as "Fraser Valley rainbow trout", typically weigh between 250g and 500g. Stocked rainbow trout at catchable sizes are eager biters, which are ideal for entry level anglers and kids who may find it challenging to catch a fish. Urban lakes are typically stocked between March and June, September and November but fish can be caught year-round. The most common, basic fishing method for rainbow trout is bait fishing. This article demonstrates two styles of bait fishing that can be quite effective in stocked lakes. Keeping your tackle simple is the key to a good day of fishing. More is not always better. In fact, too much tackle can complicate an outing if you are not familiar with it in the first place. 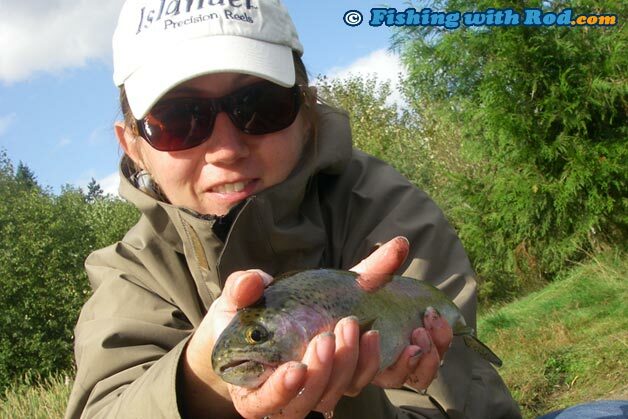 Because these rainbow trout are no bigger than 1kg, a light spinning rod is adequate enough for this fishery. Look for a rod that has a rating of 2 - 6lb test. It is also advantageous if the tip of the rod is thin, which increases sensitivity. A small spinning reel spooled with 4lb test should be used to balance with your fishing rod. Light line increases sensitivity and improves your casting distance. These terminal tackle are chosen to suit the size of fish that you are targeting. I prefer to use size 4 hooks, simply because it holds my bait better and is small enough to hook fish successfully. Trout have a tendency to swallow hooks smaller than size 4, which makes it difficult if the angler intends to release his or her catch. A float is used as an indicator to detect bites, so it needs to be small enough for the fish to pull under when they bite the hook. There is a dilemma, because small floats can be difficult to cast far. It is up to the angler to find a balance in bite sensitivity and casting distance, so be sure to experiment. Long, skinny floats tend to detect bite better, but they only work well when the lake is calm. On the other hand, round floats have a larger surface area so it is harder to pull down, but has a better balance on a windy day. Weights are required on your fishing line to bring the bait to the desired fishing depth. Without weights, you would not be able to cast your bait out. The amount of weight used depends on your fishing depth and required casting distance. Bait is a food item that is placed on the hook to entice fish. It can be either natural or artificial. Several types of bait are commonly used in stock lakes. Deli shrimp - Cooked deli shrimps are readily available at your local grocery stores. Although it is not a natural food item for rainbow trout, they seem to love it! 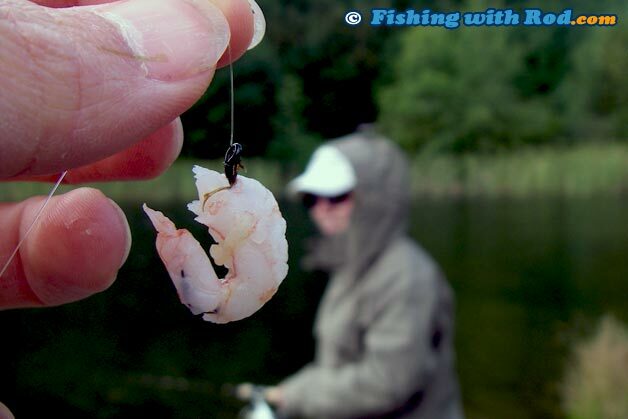 When baiting your hook, thread the deli shrimp from head to tail instead of piercing through a part of its body. This keeps your deli shrimp on the hook longer. Dew worm - These can either be purchased at your local tackle stores or collected in your backyard. A lively worm on the hook is irresistible for a trout. Krill - Frozen packages of krill are available at your local tackle stores Their scent can effectively attract fish but their soft body doesn't keep them on the hook for too long. This bait is best used when minimal amount of casting is required. Marshmallow - This is another product that is readily available at your local grocery stores. Marshmallows are easy to hook without creating a mess and the leftovers can be eaten as snacks. They are great when fished on the bottom because they are buoyant. Single salmon egg - Single salmon eggs preserved in a jar can be purchased at your local tackle stores They can be threaded onto a hook individually or tied in a mesh bag as a cluster. Artificial bait - There are many brands of artificial bait available at your local tackle stores These can be scented plastic bait, a jar of paste, powder mixture. Artificial baits are usually more expensive, but they preserve longer than natural bait. Two different styles of bait fishing are commonly used. They are float fishing and bottom fishing. Each style has its own advantages. Factors that determine which one should be used include lake size, wind, lake bottom structures and fishing location. Floating fishing involves attaching a float onto your main line and adding enough weights to balance it so only the tip of the float (the brightly coloured section) emerges on the water surface. A hook or leader is tied onto the end of your main line. The depth where you would like your bait to be is the length between your float and hook. This style of fishing is used when fishing from shore at shallow lakes with sunken debris on the bottom. A float suspends your hook above these debris so you would be catching fish instead of rocks and branches. Float fishing is not suitable when it is windy, because wind creates surface movement and makes it difficult to keep your float stationary. Watching a float diving under the water is an excitement that never gets old. When bites are frequent, it is best to hold the rod and keep the line between your rod tip and float tight so you are ready to set the hook when it goes down. As the name implies, bottom fishing involves resting your bait on the lake bottom. This works best at lakes where the bottom is free of debris. The setup is very simple. Thread your main line through a sliding weight (1/4oz or less) and tie a swivel onto it. The sliding weight should rest on the swivel once it slides down the main line. 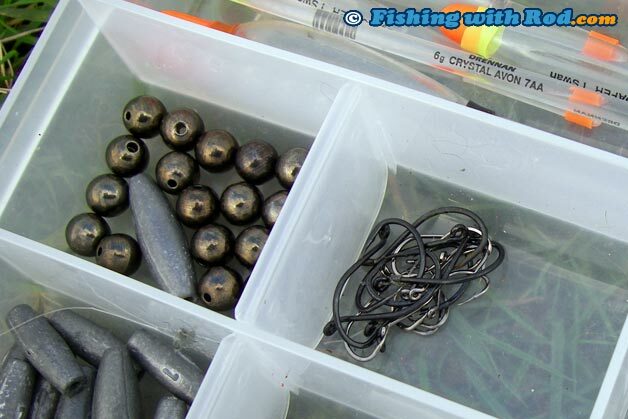 To avoid damaging the swivel, some anglers prefer adding a bead between the sliding weight and swivel. At the other end of your swivel, tie on a leader that measures between 30 and 50cm. A hook is then tied onto the end of the leader. When fishing from shore, cast your line out and allow the weight to sink onto the bottom. Once it reaches the lake bottom, your line becomes slack. 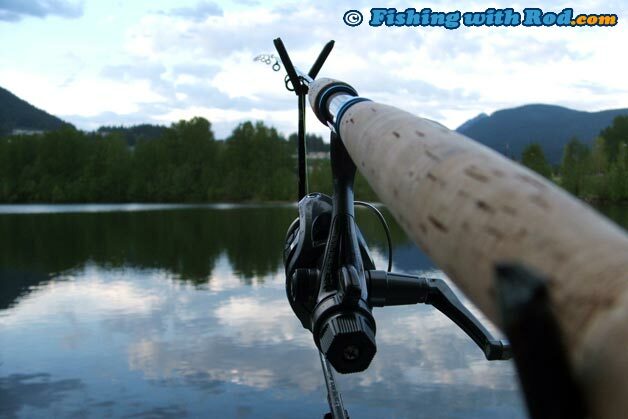 Place your rod on a rod holder or ground and slowly reel in your line until tension is regained. Watch for movement on the tip of your rod, which happens when a fish finds your bait. If this is your first stocked lake fishing trip in British Columbia, then you should be aware of existing regulations and some general etiquettes. You must have a valid BC freshwater fishing license. You can only use one fishing rod when fishing from shore, while two fishing rods maybe used if you are in a boat alone. You can only use one hook on your fishing rod. There are exceptions to these regulations at some lakes, such as catch and release only, single barbless hook requirement, and additional boating restrictions. It is your responsibility to be aware of these regulations by checking the BC Freshwater Fishing Regulations Synopsis. If you witness a violation, please report it by phoning 1-877-952-7277 (RAPP). Stocked rainbow trout are intended to create sportfishing opportunities in urban environment. Anglers are welcome to keep their quota of catches. If a fish is required to be released, please release it in a safe manner by keeping the fish in the water at all time. You can make other anglers' experience at the lake as good as yours by ensuring the survival of your released fish. General fishing etiquettes also apply in stocked lake fisheries. Please be sure to give other anglers enough space and keep your fishing space garbage free. With your assistance, we can keep our urban lake fisheries a sustainable, enjoyable resource for future generations.